HIGH QUALITY SUN BLIND WITH SECURE GRIP SUNCTIONS PROVIDED ROLLS SMOOTHLY AND GIVES A NICE SHADE AT THE SAME TIME ALLOWS VIEW FROM INSIDE OUT BUT RESTRICTS OUTSIDE IN VIEW! 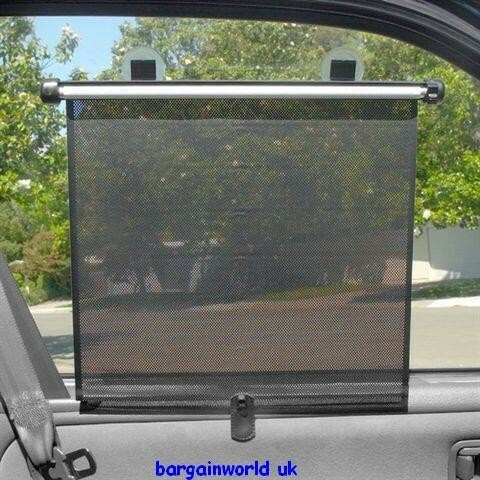 REDUCES CAR HEAT INSIDE - ALSO USEFUL FOR PETS AND ANIMALS INSIDE CARS! IMPROVES PRIVACY ! EASILY CLOSES OUT OF THE WAY - CAN BE LEFT IN THE CAR ROLLED UP AND USED WHEN REQUIRED! Measures 19 inches down by 15 inches wide - an Excellent Size! Has a built in powerfull wind up spring - all you do is to press the button on the side and it springs shut! Can stop halfway or at any point - easy to control! Once it is shut it is only 1 inch high and can stay on the top out of the way ! Two powerfull sunctions also supplied. WHY NOT BUY TWO , THREE OR FOUR FOR THE WHOLE CAR!